The motorcycle industry is generally full of doom and gloom this year, but BMW Motorrad continues to post record sales, as it boasts of a record first-half of the year, with 9.5% growth. In the first six months of 2017, BMW sold 88,389 units to customers, up from the 80,754 units sold in the first-half of 2016. That growth is attributed mostly to progress made on the European continent, says BMW, which is up 12.9% so far this year. Those European numbers break down as follows: France: 9,447 units (+21%); Italy: 9,099 units (+15%); Spain 5,573 units (+8%); and UK/IE 5,410 units (+14%). Any hopes of the US motorcycle market making gains in 2017 appear to be going out the window, as Harley-Davidson reports that its Q2 2017 sales are down a whopping 9.3% – prompting the Bar & Shield brand to readjust its delivery numbers to dealers in the United States. Sales worldwide were equally bleak for the American company, with international figures down 2.3% for the same time period. This means Harley-Davidson’s combined worldwide sales numbers are down 6.7% for Q2 2017. As a result, Harley-Davidson CEO Matt Levatich said that Harley-Davidson would see a reduction in its workforce, though he would not offer specifics on what that could look like for its mostly union workforce. Harley-Davidson released its second quarter sales results today, showing the Bar & Shield brand taking a dip in sales in Q2 2016. According to its report, Harley-Davidson sales are down 1.9% worldwide, a figure that is due mostly to the company’s performance on its home turf in the USA, which are down 5.2% when compared to Q2 2015. In fact, Harley-Davidson sales abroad saw a modest gain of 4.3%, but since the iconic American brand still sells roughly two-thirds of its units here in the United States, the sales trends here steer the company’s fate heavily. To that tune, Harley-Davidson notes that the US motorcycle industry as a whole is down 8.6% in Q2 2016 – a fair point to make, but it is also skewed by the fact that Harley-Davidson accounts for one-in-two of every new motorcycle sold in the USA. Ducati Motor Holding is reporting that it has sold over 50,000 units to customers, for the first time ever. This is a substantial improvement over the 40,650 units that Ducati delivered at this time last year, and the 45,100 units the company sold to customers in 2015. This news is a bit of a red herring though, as the sales increase comes due almost solely because of the addition of the Ducati Scrambler line, which in the first three quarters of the year was at 13,609 units sold. As we have reported before on Asphalt & Rubber, the sales increase being posted by Ducati is a bit of red herring with the brand. While the Scrambler line has shown strong growth for Ducati, the rest of the model lines have been weak for the year. A Ducati on pole? Three Ducatis on the first two rows? Four Ducatis in the top ten? Cheater tire! The only logical explanation for the grid positions the factory and Pramac Ducati secured at Qatar is the fact they have the special soft tire available to them. And that tire, we are told by everyone who is not on a Ducati, is worth a second a lap. So the grid positions of the Ducati are a travesty, right? Come the race, they’ll be rolling road blocks holding up the rest once their tires go off, right? Wrong. This narrative, current among everyone who sees their favorite rider further down the grid than they had hoped for, bears only a very passing resemblance to the truth. Dani Pedrosa took his Repsol Honda to 3rd on the grid. 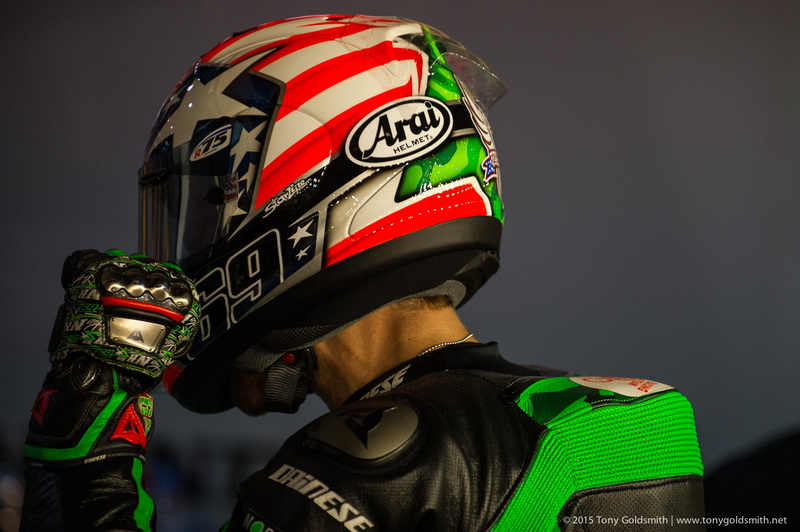 Nicky Hayden’s new stars and stripes helmet design looks awesome. 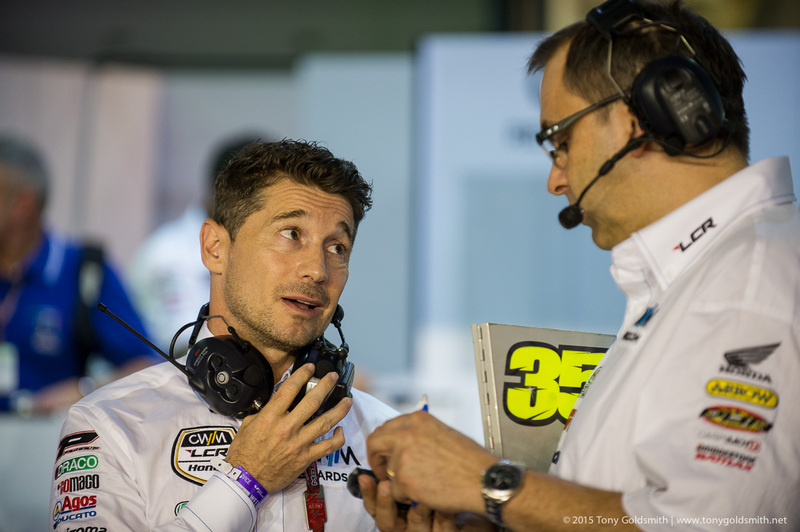 CWM LCR Honda boss Lucio Cecchinello in discussion with Cal Crutchlow’s crew chief Christophe Bourguignon. KTM continues to challenge BMW Motorrad as the top European motorcycle manufacturer (by sales volume), and has set a company record for sales in the first half of this year. Selling 70,469 units in total, KTM is just shy of the 70,978 mark left by BMW Motorrad during the same sales period, so it will be interesting to see if the Austrian brand can close the gap in the final six months, as it has done the previous two years. Friendly competition aside, the news is quite positive for KTM. The six-month sales figure represents a nearly 28% increase in unit volume, while top-line revenue is up 17.6% (€410.3 million, a record as well) and bottom-line income (EBIT) is up whopping 82.6% (€33.6 million). KTM has also increased its ranks by 204 people during the first half of 2014.